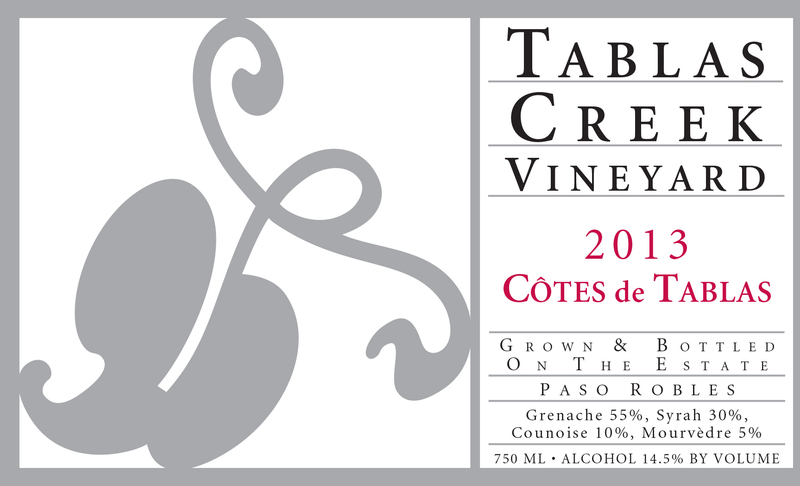 The 2013 Côtes de Tablas shows an explosive minty nose of blueberry, licorice, black plum and pepper. There's powerful fruit on the front palate, then firming up with great tannins on the back. There's a luxurious texture, with nice granular tannins and a minty garrigue cooling and lingering on the finish. Hold for six months, then drink for the next decade or more. The 2013 vintage was a classic California vintage, warm and sunny, with added intensity from the low yields produced by our second consecutive drought year. The summer was consistently warm, without the heat spikes or cold stretches that can delay ripening, and resulted in an early harvest under near-perfect conditions. The net result was a blockbuster vintage, with excellent concentration and good freshness, that should offer both early appeal and the capacity to age. Our Syrah harvest began August 27th, followed by Grenache and Mourvèdre on September 12th, and Counoise on September 26th. The last pick of all four grapes came October 7th. All varietals were fermented in a mix of stainless steel and wooden upright fermenters with the use of native yeasts. After pressing, the wines were racked, blended, aged for a year in 1200-gallon French oak foudres, and then bottled in February 2015. The wines underwent only a light filtration before bottling.